HUNTSVILLE, Texas - A serial killer was put to death Thursday in Texas after the U.S. Supreme Court rejected his lawyers' demand that the state release information about where it gets its lethal injection drug. 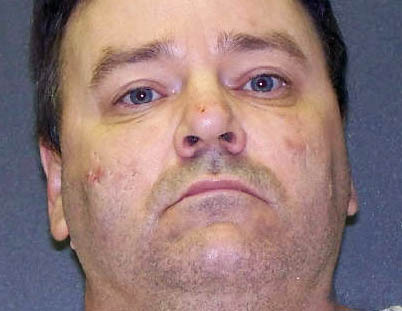 Tommy Lynn Sells, 49, was the first inmate to be injected with a dose of newly replenished pentobarbital that Texas prison officials obtained to replace an expired supply of the powerful sedative. When asked if he wanted to make a statement before his execution, Sells replied: "No." As the drug began flowing into his arms inside the death chamber in Huntsville, Sells took a few breaths, his eyes closed and he began to snore. After less than a minute, he stopped moving. He was pronounced dead at 6:27 p.m. CDT - 13 minutes after being given the pentobarbital. Terry Harris, whose 13-year-old daughter, Kaylene Harris, was fatally stabbed by Sells in 1999 in South Texas, watched as Sells was executed, saying the injection was "way more gentle than what he gave out." "Basically, the dude just took a nap," the father told reporters later outside the prison. The Supreme Court earlier in the day declined to halt the execution as Sells' attorneys sought more information from the Texas Department of Criminal Justice about the supplier of the new drug stock. State prison officials argued that the pharmacy must be kept secret to protect it from threats of violence. Lawyers for Sells contended they needed to know the name of the pharmacy in order to verify the drug's quality and protect Sells from unconstitutional pain and suffering. "My sister didn't get the constitutional pain and suffering," said Shawn Harris, the victim's brother, adding that Sells' punishment was "pretty easy" compared to what his sibling suffered: being stabbed 16 times and having her neck repeatedly slit. A jury convicted Sells of capital murder in 2000 for the death of Kaylene Harris and slashing of her 10-year-old friend, Krystal Surles, who survived and helped police find Sells. The girls were attacked on New Year's Eve 1999 as they slept in the home of Kaylene Harris' family in Del Rio, about 150 miles west of San Antonio. The Harris family had befriended Sells at a community church. Questions about the source of execution drugs have arisen in several states in recent months as numerous drugmakers - particularly in Europe, where opposition to capital punishment is strongest - have refused to sell their products if they will be used in executions. That's led several state prison systems to compounding pharmacies, which are not as heavily regulated by the U.S. Food and Drug Administration as more conventional pharmacies. A batch of pentobarbital that Texas purchased from a compounding pharmacy in suburban Houston expired at the end of March. The pharmacy refused to sell the state any more drugs, citing threats it received after its name was made public. Texas found a new, undisclosed supplier. Sells' execution was the fifth lethal injection this year in Texas, the nation's busiest state for the death penalty. Court records show Sells claimed to have committed as many as 70 killings across the U.S. In 2003, Sells was indicted but never tried for the slaying of 13-year-old Stephanie Mahaney in Missouri. He also pleaded guilty to capital murder in the 1999 death of 9-year-old Mary Bea Perez, who was strangled during an outdoor festival in Texas. Prosecutors waived the death penalty in exchange for the plea. Among his other confessions was the slaying of an Illinois family in 1987. Those victims included Ruby Dardeen, who was eight months pregnant. Her fatal beating forced her to prematurely give birth. The newborn was killed along with her 3-year-old sibling.